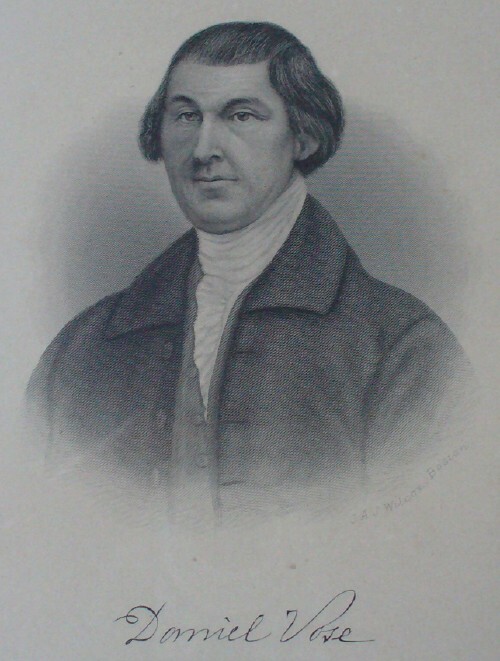 Albert Teele included this engraving of Daniel Vose (by J.A.J. Wilcox of Boston) in his 1887 history of Milton. Daniel was born on February 20, 1741, the eldest son of Captain Thomas Vose, on his father's farm in Milton where Atherton Street meets Canton Avenue today. A leading man of his day, he was also active in the early wars. Through the last half of the eighteenth century, Vose was involved in the civil and military affairs of Milton. He was a sincere patriot who rendered important service to the country. Throughout his working life he was looked upon as the leading business man in Milton; carrying on a large and varied trade, as well as being the medium of exchange for the producers of the town and many interior towns. Loaded teams bringing merchandise from country stores made his store their destination, receiving in exchange West Indian goods and other commodities. Butter, cheese, eggs, flaxseed, and hoop-poles were commonly traded; in return the store furnished everything from a hogshead of molasses to a paper of pins. Vose was also the owner of numerous sloops which ran to Boston, Salem, and Gloucester, meeting the demands of his business and carrying a variety of products from the mills along the Neponset River.